Whether you enjoy culture, festivals, history or nature, Charleston has something for you. Whether you enjoy culture, festivals, history or nature, Charleston has something for you. From Champaign it’s about an hour’s drive as you take Interstate 57 south, get off at Exit 192 and take Illinois 130 east. “It’s reasonably priced, and they have international acts and lots of different things,” Tourism Director Diane Ratliff said. EIU’s Tarble Arts Center showcases visual arts. Its permanent collection includes Illinois folk art and contemporary art. Along with exhibits, there are outdoor sculptures and a gift shop, and it hosts classes and lectures. 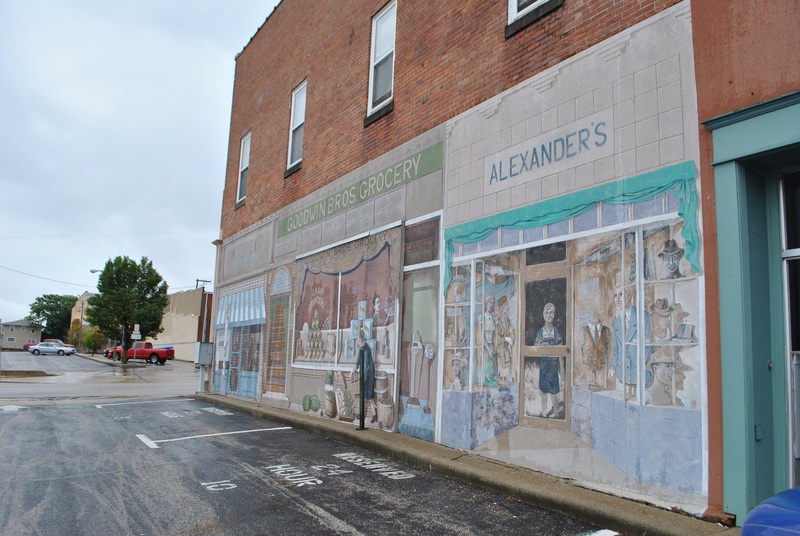 There are seven murals around Charleston’s downtown square, painted in 1998. “They’re representations of different things from the city’s culture and past,” Pamperin said. The 5,400-seat Lantz Arena is home to EIU basketball and volleyball. Within the same complex is Lantz Indoor Fieldhouse, home of Panther indoor track and field and the indoor practice facility for all teams. Also in the complex is Ray Padovan Pool, home to EIU swimming. The 10,000-seat O’Brien Field hosts Panther football and outdoor track. Each spring, EIU and Charleston host an outdoor festival called Celebration: A Festival of the Arts that includes a weekend of live music, festival-style foods and an art fair with everything from blacksmithing to watercolor. EIU’s Family Weekend typically features a concert, and homecoming week includes activities like an all-you-can-eat breakfast, 2.5-kilometer race, parade and football game. July’s Red, White and Blue Days is usually highlighted by a free concert by a nationally-known performer (last year it was Lonestar), parade, bell-ringing ceremony, children’s games and all-you-can-eat ice cream. In December, Christmas in the Heart of Charleston brings a holiday parade, carriage rides, refreshments, window displays, entertainment, photos with Santa and live reindeer. Downtown storefronts are decorated, and some have live window displays. Many stores offer specials and events. “It’s very family-friendly,” Pamperin said. Abraham Lincoln traveled to Charleston as he rode the Circuit of the Eighth Judicial District from 1847 to 1857. “Lincoln in Charleston is a pretty big deal,” Pamperin said. The Lincoln Douglas Debate Museum is Illinois’ only museum that depicts all Lincoln versus Stephen Douglas debates through film, audio selections, artifacts and photos. It’s open to the public from 9 a.m. to 4 p.m. seven days a week for self-guided tours. Lincoln visited his stepsister, Matilda Moore, at her home southwest of Charleston Jan. 31, 1861, on his final visit to Coles County before leaving by train for his inauguration. “It was in his heart,” Pamperin said. Visitors often come from nearby states like Indiana and Ohio, and some have come from as far as Shanghai. Sirius-XM Radio personality Gordon “Phlash” Phelps has even made reference to Charleston. “It just kind of shows people gravitate to Charleston and see the Lincoln sites here in town,” Pamperin said. One of the most famous cases Lincoln tried in Charleston was one in which he assisted in prosecuting slave owner Robert Matson’s case against two Coles County abolitionists, Dr. Hiram Rutherford and Gideon Ashmore, who took Matson’s slaves to press the issue of slavery. In 2017, the City of Charleston received the Governor’s Hometown Award for its trail system, the product of a meeting four years earlier by a group of local bicycle enthusiasts to brainstorm ways to upgrade the lake’s trail system. In early 2014, the system was comprised of about 2 miles of single-track trails around the lake. With the help of private partners, a group of volunteers and public works employees started improving the trails and hand-building more single-track trails around the lake. For those who like an adrenaline rush, the west side’s trail is more challenging, with steep grades. “These aren’t flat prairie trails,” Pamperin promised. For those wanting less adventure, the east side has a 9-foot asphalt path accessible by wheelchairs and walkers, and the Embarras River can be seen on the other side. There are four roof structures with benches evenly spaced along the path, where pedestrians can stop and rest. Plans are in the works to apply rip rap to the slope at the north edge of the property overlooking the trail to prevent slope erosion. On the south side is an oil-and-chip surface. A local Boy Scout troop contributed four Adirondack chairs for those who want to sit to take in the view. A new pavilion and restroom facilities built in the spring already have been used extensively. Assistant Director of Public Works Greg Culp said plans are in the works for a playground and tree-slung hammocks under the oaks there. In addition to the public, EIU biology and recreation classes use the facilities. EIU’s Civic Engagement and Volunteerism department has students volunteering at the trails. “We have a lot of interaction with students,” Pamperin said, adding that the City hopes that the amenities will help the university in both recruiting and retaining students, as well as keeping them in Charleston after graduation. “The City is able to offer a lot of different things for the size we are,” he said. The Lincoln Prairie Grass Trail connects Mattoon and Charleston with a crushed limestone trail that’s going to be upgraded to a multimodal trail. The goal is for people to be able to take a train from Chicago, get off at Mattoon and bike to Lake Charleston. “We’re trying to build this into a regional destination for mountain bikes,” Pamperin said, adding that Fox Ridge State Park, south of Charleston, has its own set of trails and that the Grand Prairie Friends’ Warbler Ridge trails, between Charleston and Fox Ridge, would ultimately connect everything in the region. The 16-acre Sister City Park, from which the 1.5-mile Yellow Trail starts, has playground equipment, a pavilion, basketball court, sand volleyball courts, a baseball/softball diamond, soccer field and a roller hockey rink. Birdwatchers frequent Fox Ridge State Park to see over 300 bird species, and the Lake Charleston area is home to a bald eagle family. There are two canoe/kayak launches at Fox Ridge, providing a 5-mile trip on the Embarras; boats are allowed on Lake Charleston, too, as long as they don’t go over 5 miles per hour. Lake Charleston hosts a lot of fishing tournaments, with the lake being home to largemouth and smallmouth bass, walleye, catfish, spotted bass, white bass, striped bass and trout. “I’ve heard people say it’s a hidden gem for crappie fishing,” Ratliff said. For those who enjoy spotting smaller wildlife, the Urban Butterfly Initiative is creating butterfly hotspots in the Charleston Carnegie Public Library’s parking lot, at the Lake Charleston levee trailhead’s new pavilion, in Fox Ridge State Park, at the Loxa Road access to the Lincoln Prairie Grass Trail and in EIU’s Secret Garden. 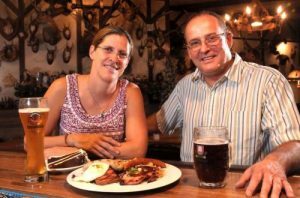 Bayern Stube serves authentic German food.